General's Highway Corridor Park Baseball Field 1 is just to the left of Field A, the lighted upper multipurpose field. An aerial view showing Field Designations and Facilities is available by clicking HERE. Corridor Park is located off of Crownsville Road connecting General's Highway (MD 178) to Defense Highway (MD 450) where it becomes South Haven Road. From Defense Highway the Park is located 1 mile on the left across from the Renaissance Festival and from General's Highway it is about 2 miles on the right. Here is a map for Map of General’s Highway Corridor Park. Anne Arundel County information on the park can be obtained by clicking HERE. General's Highway Corridor Park Baseball Field 2 is behind the baseball field just to the right of Field A, the lighted upper multipurpose field. An aerial view showing Field Designations and Facilities is available by clicking HERE. General's Highway Corridor Park Baseball Field 3 is to the back left of the baseball field just to the right of Field A, the lighted upper multipurpose field. An aerial view showing Field Designations and Facilities is available by clicking HERE. General's Highway Corridor Park Baseball Field 4 is behind the furthest parking lot from the entrance. An aerial view showing Field Designations and Facilities is available by clicking HERE. General's Highway Corridor Park Field A is the Upper and Lighted Field of the two Multipurpose Fields. It is also closer to the Parking Lot and further from the Gate as compared to Field B. An aerial view showing Field Designations and Facilities is available by clicking HERE. General's Highway Corridor Park Field B is the Lower and unlighted Field of the two Multipurpose Fields. It is also closer to the Gate and further from the Parking Lot as compared to Field A. An aerial view showing Field Designations and Facilities is available by clicking HERE. Germantown Elementary School Fields (there are many) are located behind the school building on Cedar Park Road and behind the tennis courts on Locust Avenue. Click HERE for a map. There is a parking in front of the tennis courts and the parking lot is accessible from both Cedar Park and Locust. There is also on-street parking. To get to the intersection of Cedar Park and Locust you will need to make a right turn onto Farragut from Rowe Boulevard as you drive towards Annapolis Center. The St. Mary's Sticklettes Program map for 2007 is HERE. The Rolling Knolls Elementary School (RKES) combined Basketball Court and Gym is in the school building. There is a parking in front of the school. To get to the front of the school turn onto Knollwood Road from General's Highway (MD 178) and follow for 50 yards where it becomes Valley Road. Follow to the right for another 50 yards and school parking is on your right. Knollwood Road is between the signals for Bestgate/Housley Roads at the Mall and Epping Forest Road where the Annapolis Veterinary Hospital is located. Click HERE for a map. Rolling Knolls Elementary School (RKES) Library, also called the Media Center/Room, is in the school building. There is a parking in front of the school. To get to the front of the school turn onto Knollwood Road from General's Highway (MD 178) and follow for 50 yards where it becomes Valley Road. Follow to the right for another 50 yards and school parking is on your right. Knollwood Road is between the signals for Bestgate/Housley Roads at the Mall and Epping Forest Road where the Annapolis Veterinary Hospital is located. Click HERE for a map. Rolling Knolls Elementary School (RKES) Field A is the Upper Field over 100 yards in length located by the school building and playground. There is a parking in front of the school. To get to the front of the school turn onto Knollwood Road from General's Highway (MD 178) and follow for 50 yards where it becomes Valley Road. Follow to the right for another 50 yards and school parking is on your right. Field A is beside the parking lot. Knollwood Road is between the signals for Bestgate/Housley Roads at the Mall and Epping Forest Road where the Annapolis Veterinary Hospital is located. Click HERE for a map. 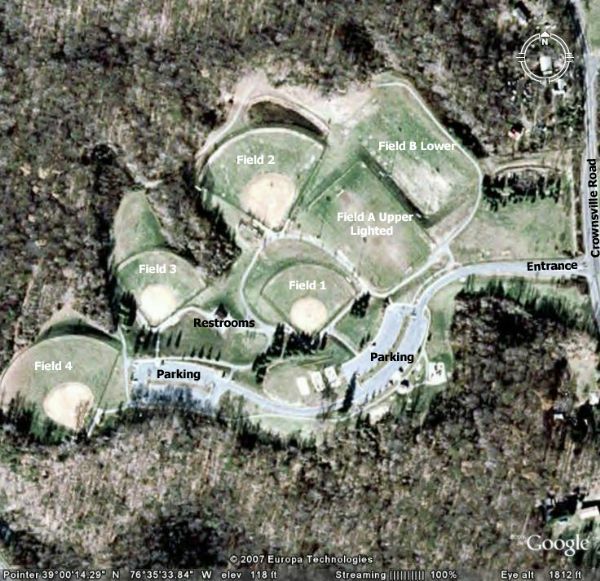 Rolling Knolls Elementary School (RKES) Field B is the Lowerr Field over 70 yards in length located away from the school building, down the hill, nearest General's Highway (MD 178). There is a parking in front of the school. To get to the front of the school turn onto Knollwood Road from General's Highway (MD 178) and follow for 50 yards where it becomes Valley Road. Follow to the right for another 50 yards and school parking is on your right. Field B is down the hill and past Field A which is beside the parking lot. Knollwood Road is between the signals for Bestgate/Housley Roads at the Mall and Epping Forest Road where the Annapolis Veterinary Hospital is located. Click HERE for a map.